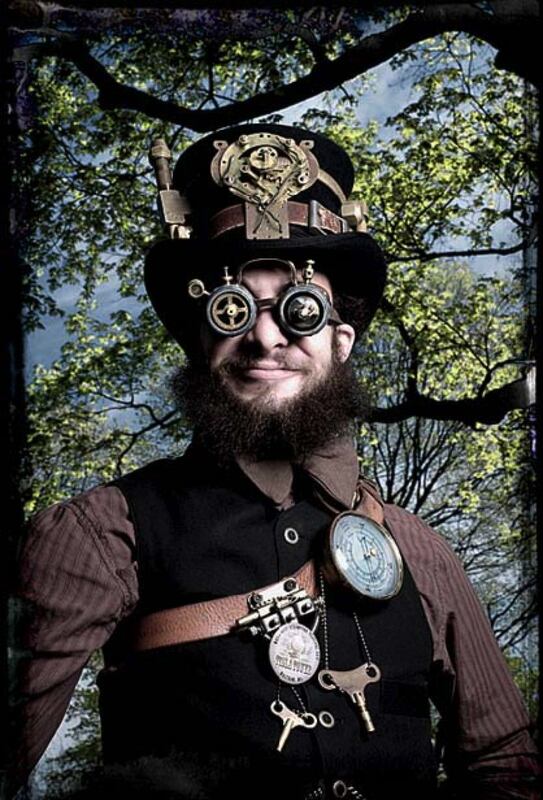 On May 13, the Watch City Steampunk Festival takes over downtown Waltham, Massachusetts. Expect fire-breathers and aerialists, blacksmiths, live theater, and rock and folk bands with a ragged edge, like Frenchy and the Punk. There will also be loads of artists with an industrial bent, like Waltham’s Todd Cahill, along with vendors offering “steampunk” clothing, accessories, and contraptions, and patrons wearing them. Artist Cahill is a mechanical engineer and self-described “interpreter of technology”; he constructs models of nineteenth-century engines in a studio fittingly located in the complex of former mill buildings located downtown, along the Charles River. Waltham was a centerpiece of the American industrial revolution, and is thus directly tied into the festival’s themes, Perry notes. The complex grew out of the nation’s first integrated textile mill, a four-story brick structure built by Francis Cabot Lowell, A.B. 1793, established there in 1814. It predated the ultimately larger factories around which Lawrence and Lowell were built—and paved the way for many subsequent Waltham-ased industries, including the Waltham Watch Company, which operated from 1854 to 1957, engendering the “Watch City” nickname.